Hear from Kent Riddell at CSL Behring, below. HR data security is top of mind for Kent Riddell, Senior Manager of Business Solutions HRIS at CSL Behring. So when the HR team needed a system for managing employee files globally, he was happy to see that PeopleDoc met their security requirements and integrated with their HRIS, Workday. With the two systems integrated, HR now has a one-stop-shop for employee files. Any HR member (with the appropriate permissions) can access any employee file, regardless of their geographic location. In this video, hear from Kent on how PeopleDoc meets CSL Behring’s standards for data security and privacy. Manage employee files globally and securely. Global HR teams need a single source of truth when it comes to employee files. Productivity suffers when only certain team members can access data for certain regions, or when they have to navigate multiple systems to find the information they need. Enter PeopleDoc Employee File Management. 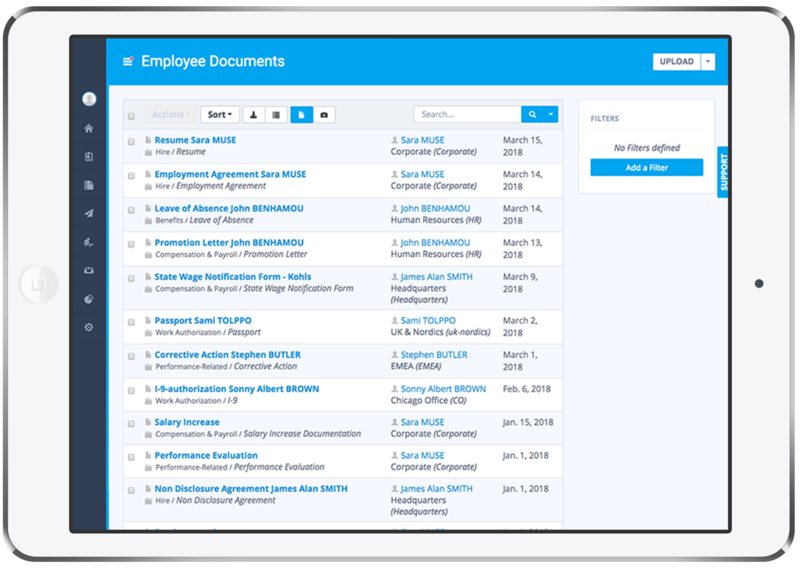 It makes it simple for HR to efficiently manage employee files from anywhere, on any device, while controlling access to data based on document type and user role. See how PeopleDoc's Employee Case Management solution empowers employees to find their own relevant HR information, and also enables HR to route and rapidly respond to more complex, non-routine requests. This checklist gives your organization an 8-step framework for tackling global compliance. Discover why the HR Operations team at GoDaddy turned to PeopleDoc to help them consolidate, store and easily manage employee files.